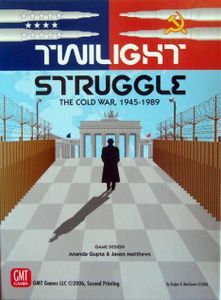 Buy Twilight Struggle and PriceWatch, Buy this board game at the Lowest Price. The game covers the Cold War that followed WWII. You would be hard pressed to find a game where mechanics match theme so well. The game promotes an atmosphere of tension where you are continuously forced to choose the lesser of two evils while you struggle for dominance. This seems to hold true to the era the game recreates. The Components look cheap but the cards are fine. The influence tokens are simple tokens which are perfect for their function. The board is cheap but works. The art work is pretty much old photos from the time period which I like. The really big problem is the price. This game is VERY expensive for the physical components that you are going to get. Outstanding and Tense. Fortunately the gameplay contained in this game more than makes up for the quality of the components. Twilight Struggle is a card driven game. The game begins with cards themed around the early war and as the game progresses you shuffle in cards from other mid and late war. Players will draw a hand of cards each round. They will then take turns playing the cards. Most cards will have a value in the top corner and an event on the bottom. A player will get to spend the operational points to perform actions or use the event if the event favors the active player. If the event favors the opponent the active player will get to use the points and the event occurs. This will make for some very difficult decisions. There is an escape, when a card is too bad to play, with the space track. This is an interesting mechanic where a player can get rid of a card that would hurt them in exchange for a small bonus but this can only be done once per round. Another interesting aspect of the game is that scoring cards are mixed into the deck and the player that was dealt the card will get to choose when to play it as long as it is during the same round it was dealt. Except for the first game (in which I dominated my friend Paul) the games have been very close all the way to the end. Through the Roof. This game will take a couple rounds to learn but I don't think I will ever be able to master it. There are enough card combinations and the game is so intense that once learned it will keep you coming back. If I were forced to flee from unnamed communists invaders with a group of high school students in a truck preferably driven by Patrick Swayze to start a renegade troupe similar to the werewolves of post WWII Germany would this game serve to raise our spirits as we plotted the liberation and reconstruction of our home? Yes.